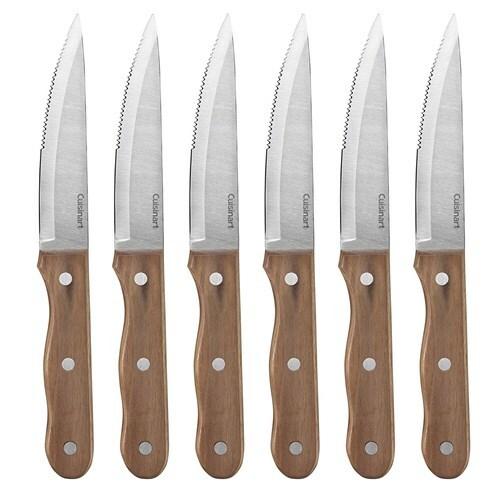 The Cuisinart C55W-S6STK is a 6-Piece triple rivet walnut steak knife set which features superior high-carbon stainless steel blades for precision and accuracy. 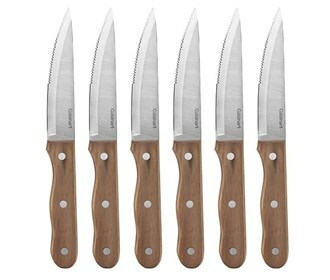 Rivets secure the full-tang and half-tang blades to the ergonomically designed handles. Provides perfect design for easy cutting of steak or poultry. The Cuisinart C55W-S6STK has many exciting features for users of all types. See the Cuisinart C55W-S6STK gallery images above for more product views. The Cuisinart C55W-S6STK is sold as a Brand New Unopened Item.